Here you can go on a free tour! USA:s oldest City Hall offers free tours. They have tours that you need to book and also tours were you only show up, read more below. 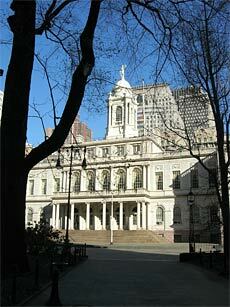 City Hall is the headquarters of the New York adminstration. Here the mayor of the town also have his office. 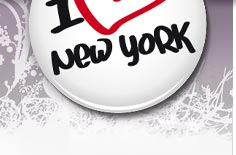 The present Mayor in New York is Bill de Blasio (2014) and he is the 109th. The building is an architectural achievement and was built between the years 1803 and 1812. City Hall is included in the the National Register of Historic Places. There was an architect competition announced before the construction of City Hall. The winning team were Joseph François Mangin (1794-1818) a French immigrant and John McComb, Jr. (1763-1853) a native Newyorker. They won $350 for their proposal. The construction work was delayed because the members of the cabinet thought the proposal was to extravagant. The architects had to think again and reduced the size a bit and also changed the building material to brownstone at the rear of the building. This to lower the costs. Also the conflicts between the labors and the outbreak of yellow fever further slowed the construction. The building opended to the public in 1812. The exterior facade reflects that of the French Renaissance (with big curved windows) and the interior that of the American-Georgian style with columns and corner pillar in Corinthian and Ionisk style. On the inside, the rotunda is a soaring space with a grand marble double stairway rising up to the second floor, where ten fluted Corinthian columns support the coffered dome. The City Hall´s roof has a remarkable cupola with a staty of the Justice. In the 1950´s they replaced the earlier brownstone and the marble fasade to limestone. Abraham Lincon has been here! In 1861 the newly elected President was received here in the Governor's Room, Abraham Lincoln (1809–1865), he was the 16th President. City Hall was also one of the places were Abraham Lincoln´s coffin "lay in state" in 1865. Abraham Lincoln was shot April 14th, 1865 at Ford's Theatre in Washington D.C. He was there to see the play - Our American Cousin. He never woke up and he was declared dead April 15th, 1865. Today he is buried at Oak Ridge Cemetery, Springfield, Illinois. In City Hall you have a significant historical portrait collection with approx 100 painting from late 1700s til today. Among the collections you can find the portrait of Alexander Hamilton painted by John Trumbull 1805. Alexander Hamilton´s face is also on the U.S $10-bill. New York is as you know a well-known movie location. Even City Hall have been in movies and TV-series. The series - Spin City - with Michael J. Fox, who have to take care of the the bit unconventional Mayor in New York. It was a big success and was as a TV-serie between 1996 - 2002. The movie City Hall were Al Pacino playes the Mayor and John Cusack the deputy Mayor (1996). City Hall offers free guided tours. Some days of the week you can join a tour in the building. Check before if you have to book or not, some tours you need to book and some you can just show up.